Perry is proud to say that his mother is Raiford Scott, the first registered woman architect in South Carolina. His father, Ronald Scott, was the State Planner for North Carolina. His siblings include ISO Assistant Principal Viola Beverly, Marian, an architectural historian, and Lauren, a cellist with the Pittsburgh Symphony Orchestra. Perry's wife Lisa is an ISO violinist, and with brother Bev and his wife, pianist Sylvia Patterson-Scott, they are collectively known as the Scott Chamber Players, longtime artists-in-residence at the Indianapolis Museum of Art. 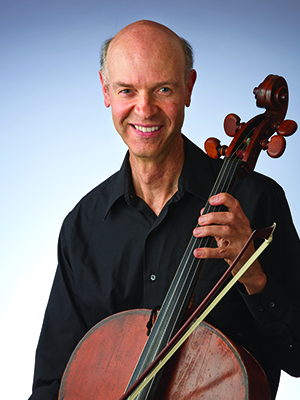 "I play a 'hybrid' cello," Perry says. "The top was made in Venice by Matteo Goffriller in 1696. The back and sides are the work of the Roman maker Francesco de Emiliani from around 1730. And the scroll is made by an unidentified Flemish craftsman of a slightly later period." Perry and wife Lisa live in a home tucked away in the woods, complete with a large-windowed music room, which is a perfect fit for Perry's non-musical interests. "I have done rare plant inventories for the Indiana DNR, and do botany field studies in the Boundary Waters Wilderness and Quetico Provincial Park," he says. "I hope after many years of field work to write a book on the complete vascular flora found in this two-nation wilderness." Perry and Lisa are the proud parents of two sons. Aaron is at IU in Bloomington and about to apply to medical school and Brian is at the University of Vermont pursuing a degree in geology.